Northwest Rubber Extruders' LRT elastomeric grout is a special, two-component formulation made with fast-setting, return to service polyurethane. This product is specifically designed for use in rail applications to fill the spaces between transportation rail structures and adjacent concreted. LRT elastomeric grout provides electrical isolation for electrically-powered light rail and street car tracks. 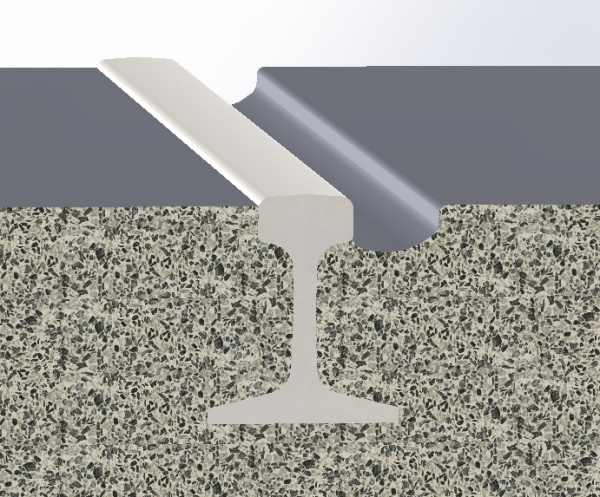 It also absorbs vibration to prevent cracking and damage, and reduces noise caused by rail traffic. Rail intersections, stations & "frogs"
For more information, view our LRT brochure. Request a quote on elastomeric grout for your application, or contact Northwest Rubber Extruders to learn more. We also offer thermoplastic rail boots, which provides many of the same benefits and characteristics, and may be better suited to certain rail applications.